Sometimes a recipe is born simply from a suggestion. While being told about a chicken dish that was enjoyed on a recent trip to Vegas, my mind was clicking away, trying to think about how to prepare a similar dish, having never seen the original, with the description more about how good it was, not really about how it was made. Our conversation wandered along several paths, never returning to the chicken dish. 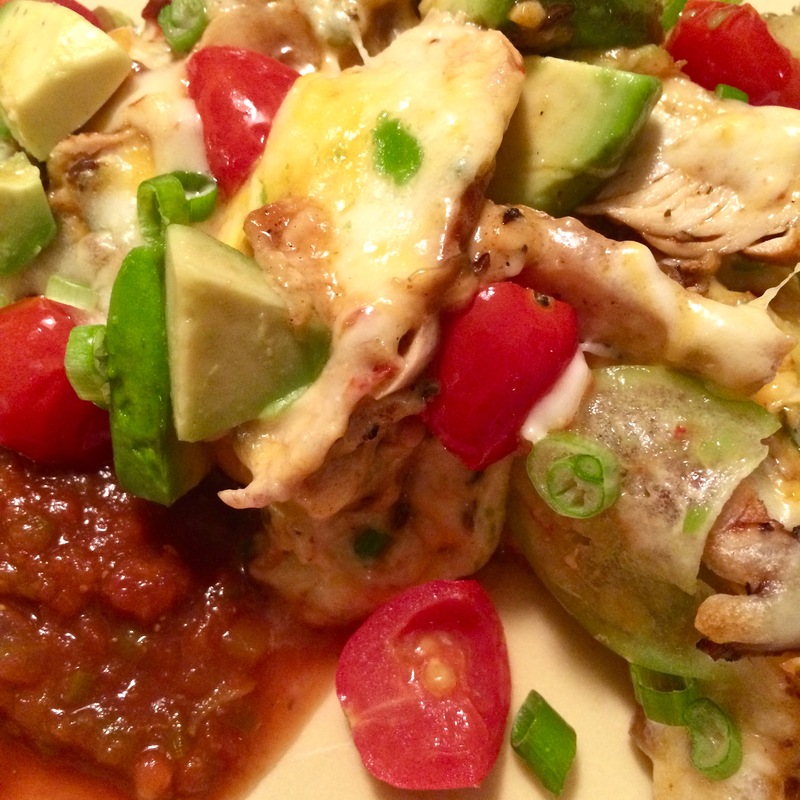 Several nights later I played the “what if” game while cooking what turned out to be the first draft of this very fresh, spicy dish of chicken with a light topping of melted cheese, and topped with fresh tomatoes, avocados, tomatillos, & green onion. Theoretically it should feed four. So far, it has only ever fed two, with no leftovers. 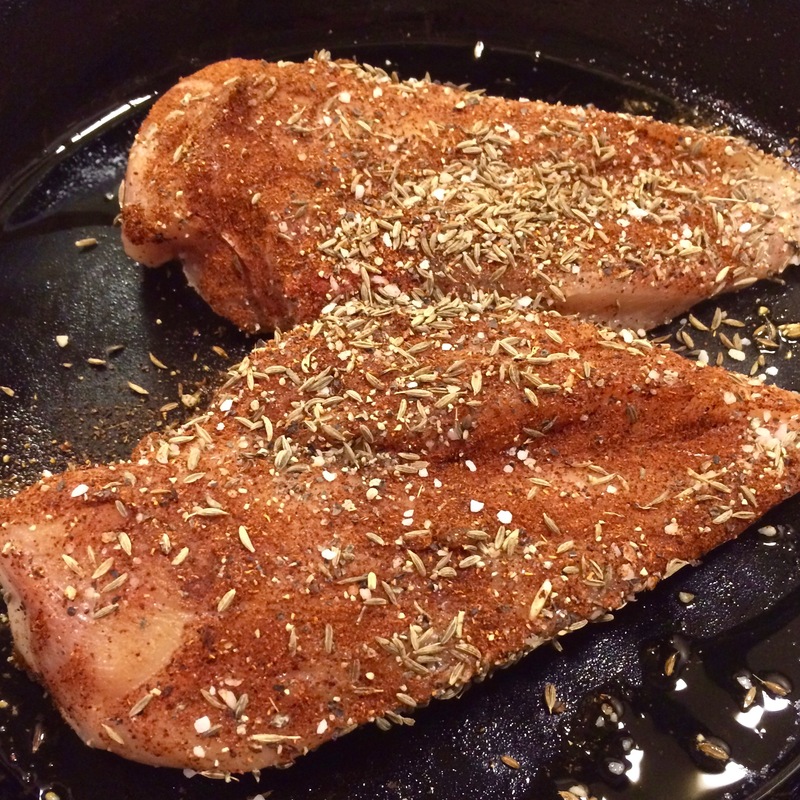 Dry rub the chicken breasts allover with a liberal sprinkling of chili powder, cumin, salt & pepper. Heat the oil in a 10”oven proof skillet over medium high heat (I use a well-seasoned cast iron pan). Add in the chicken breasts, and lower the heat to medium, cook for 8 minutes. Turn, and cook for another 6-8 minutes, until just done, internal temperature should be 74°C / 165°F. 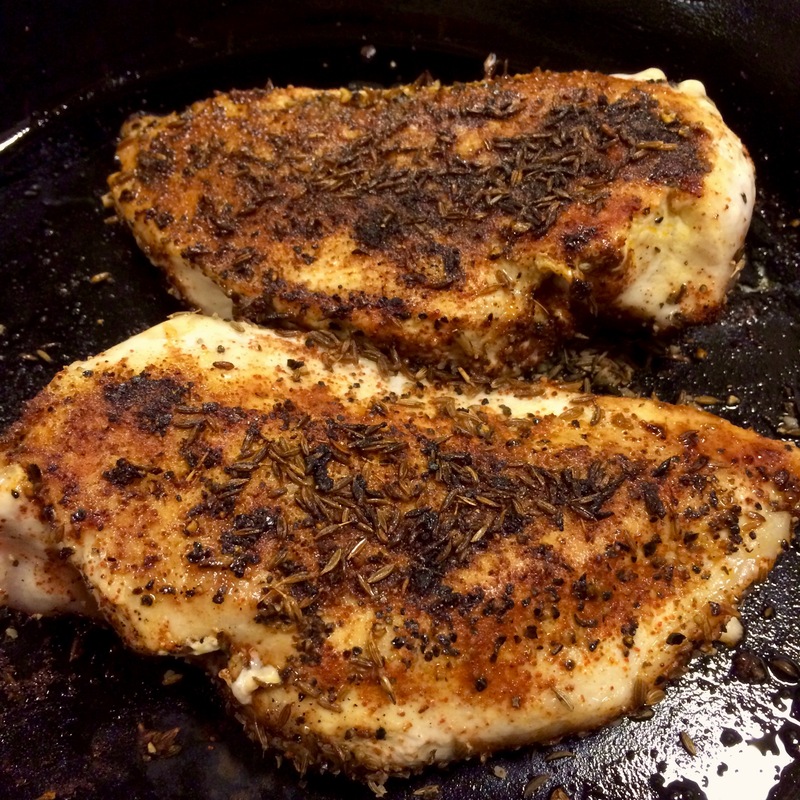 Remove the chicken from the pan to a plate and let rest. While the chicken is cooking, cut the peeled onion in half lengthwise, and cut crosswise into thin slices, less than ¼“ thick. Thinly slice the cloves of garlic. Cut the tomatillo in half, and thinly slice crosswise. 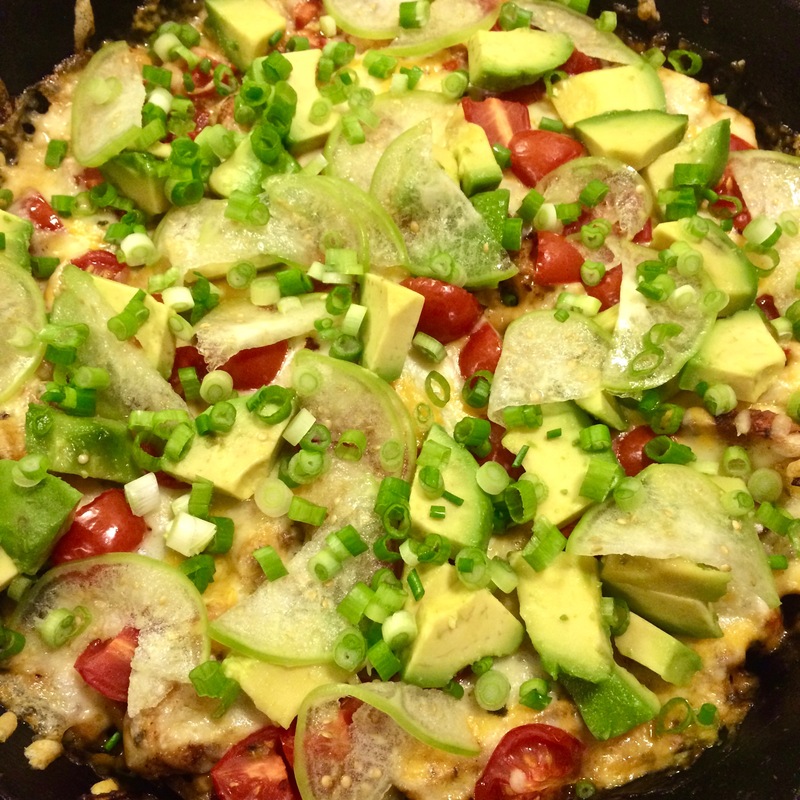 Cut up the avocado into chunks slightly larger than the tomatoes. 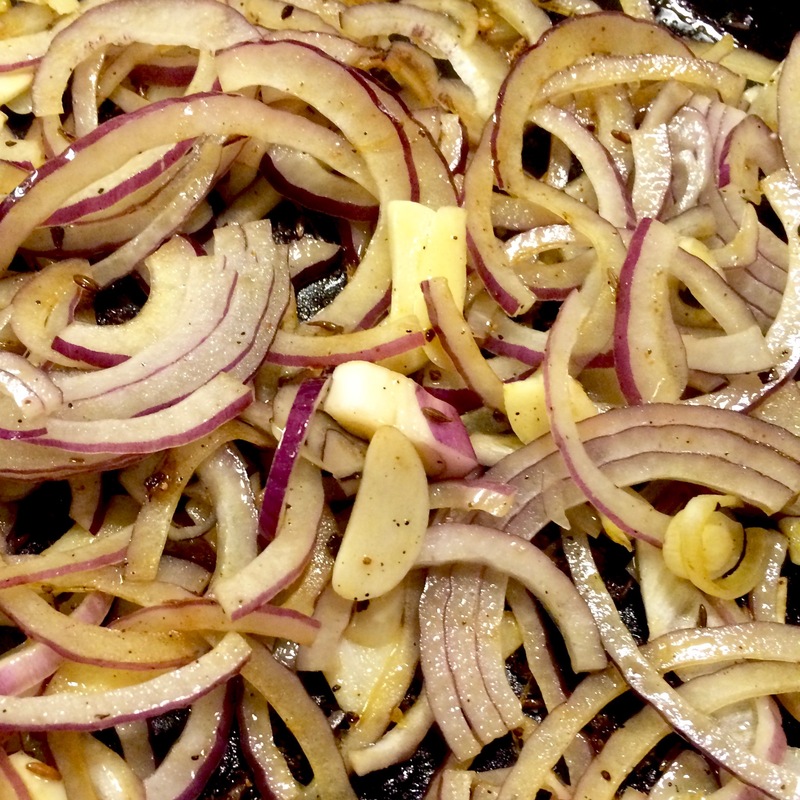 After removing the chicken from the pan, add in the sliced onion & garlic into the already hot pan. Cook & stir over medium heat for about 6 minutes, until clear and just starting to colour. 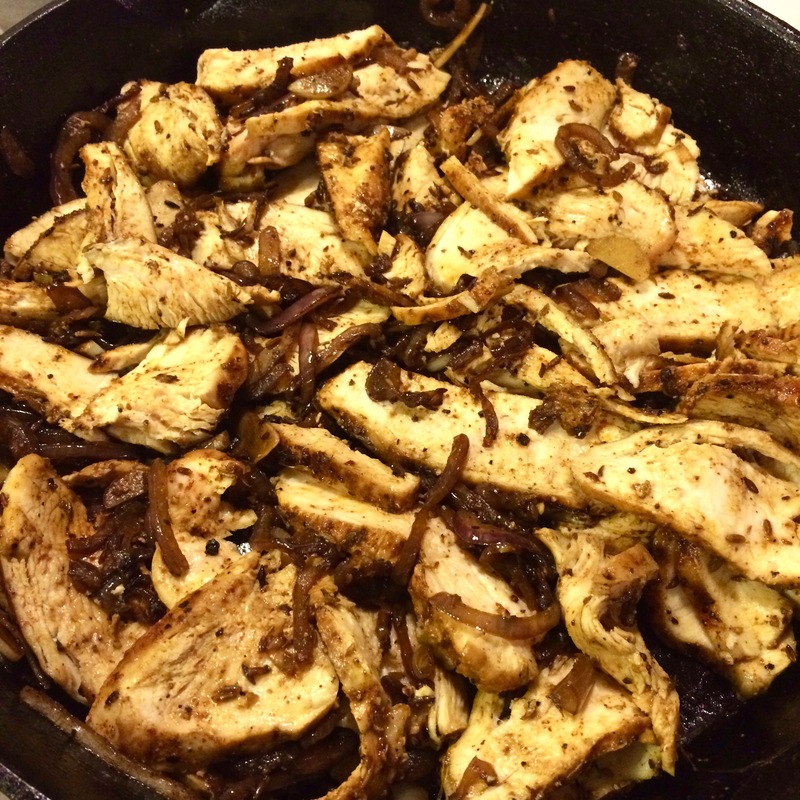 Slice the chicken into ¼” pieces, and stir into the cooked onion & garlic, and let it reheat. 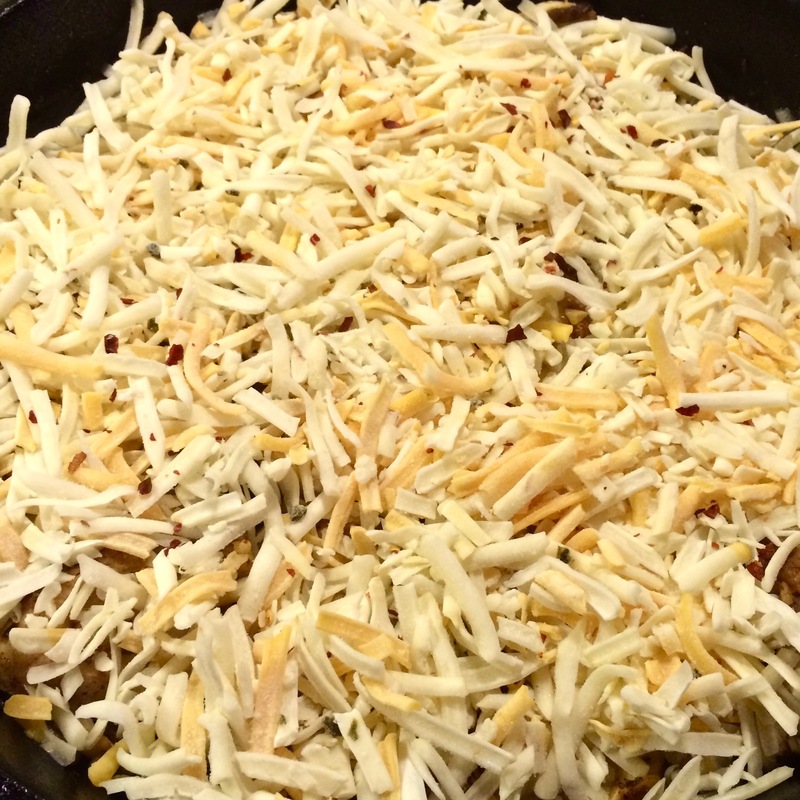 Evenly sprinkle the grated cheese over the whole of the chicken mixture. Sprinkle the top with a pinch of dried chilies. 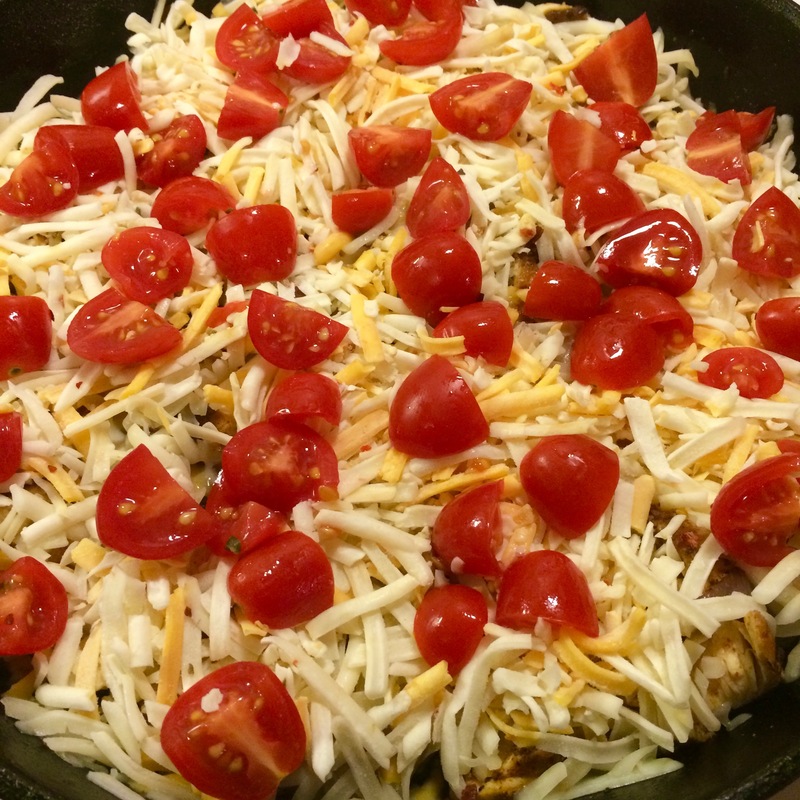 Arrange the tomato quarters over the top of the cheese. 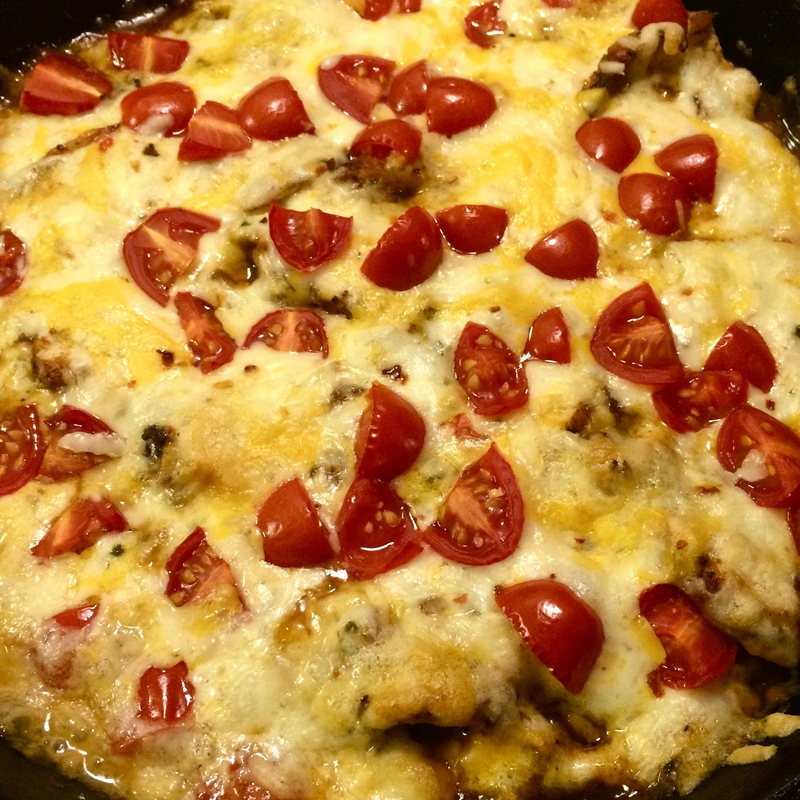 Insert the skillet into the preheated oven. Cook for 7 minutes, just until the cheese has melted and started to bubble around the edges. Top with the avocado & tomatillo, evenly arranged. Finish by scattering the green onions over top. Serve straight from the pan, with salsa & sour cream alongside. Great served with a crisp green salad. 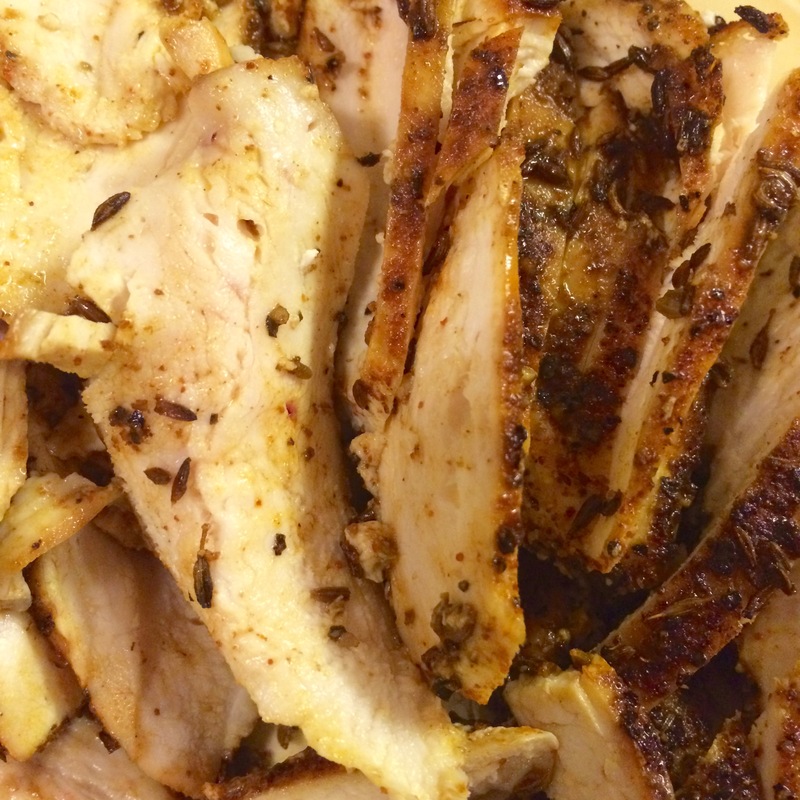 Options: use 6 boneless, skinless chicken thighs in place of the two chicken breasts. or prepared pulled pork, in place of the chicken. All have been tried and all are great.